1. Arrival At Satna Railway Station on 02 October 2016 and Departure at Pipariya Railway Station on 10 October 2016. 2. Arrival At Satna Railway Station on 09 October 2016 and Departure at Pipariya Railway Station on 17 October 2016. 3. Arrival At Satna Railway Station on 16 October 2016 and Departure at Pipariya Railway Station on 24 October 2016. 4. Arrival At Satna Railway Station on 23 October 2016 and Departure at Pipariya Railway Station on 31 October 2016. 5. Arrival At Satna Railway Station on 30 October 2016 and Departure at Pipariya Railway Station on 07 November 2016. 6. Arrival At Satna Railway Station on 06 November 2016 and Departure at Pipariya Railway Station on 14 November 2016. 7. Arrival At Satna Railway Station on 13 November 2016 and Departure at Pipariya Railway Station on 21 November 2016. 8. Arrival At Satna Railway Station on 20 November and Departure at Pipariya Railway Station on 28 November 2016. 9. Arrival At Satna Railway Station on 27 November and Departure at Pipariya Railway Station on 05 December 2016. 10. Arrival At Satna Railway Station on 04 December 2016 and Departure at Pipariya Railway Station on 12 December 2016. 11. Arrival At Satna Railway Station on 11 December 2016 and Departure at Pipariya Railway Station on 19 December 2016. 12. Arrival At Satna Railway Station on 18 December 2016 and Departure at Pipariya Railway Station on 26 December 2016. 13. Arrival At Satna Railway Station on 25 December 2016 and Departure at Pipariya Railway Station on 02 January 2017. Due to meager no. of safaris, you are strongly advised to book Madhya Pradesh Tour Package almost 120 days prior of Arrival to avoid inconvenience. A sight to behold – the most amazing beauty of nature – The white tiger. A tiger in nature is born once in centuries. Maharaja Ramchandra of Bandhavgarh was contemporary of Akbar. Tansen, the King of Music and the humorist Raja Birbal, both joined Akbar’s court from Bandhavgarh. The oldest recorded information about White Tiger dates back to 1561. There is a painting in second part of “Akbarnama” which describes the ruling era from 1560 to 1578. The painting depicting the scene of hunting by Akbar shows two white tigers in it. Again first white tiger cubs in 1951 in the forest of Madhya Pradesh’s Bandhavgarh. Bandhavgarh Maharaja Martand Singh was found. 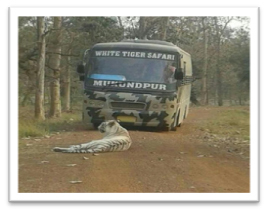 The “Mohan White Tiger Safari” is main attraction of Bandhavgarh, because it is first safari of White Tigers, where you can see “White Tigers” as a wild, and the chances to see “White Tigers” in this Safari is very high approx. 99%. Nature is splendid. It is full of diversity and richness. Bandhavgarh is bestowed with a special gift of nature as its lush green forests, exotic species of plants and animals, rills of crystal clear water, mighty mountains, unique birds, wide spaces of land, and varied wildlife awaits you. We offer to show you magnificent sights of Tigers at Bandhavgarh. Making a magnificent trip to Bandhavgarh will definitely take you to the lush greenery of the forested regions that are incredibly the natural abode of the variant of wild species. You can have it all in a complete organized way, with jeep safari you can have a closer look to all these majestic creatures including the royal Bengal tigers and making a safe and visible glare to these species will complete your jungle safari in a true sense. Kanha is truly the land of tiger. It has been proved since years as it has largest number of tigers compare to any other national park in and India and above all it is declared as the best managed national park to protect not only tigers but also other wildlife animals and the life of villagers living inside and around the national park. 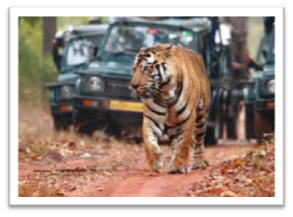 Kanha Tiger Reserve is perhaps the primer venue in the world today in which to view free-living tigers. Kanha also supports an exotic and colorful array of birds, including Indian rollers, bee-eaters, golden orioles, paradise flycatchers, egrets, some outlandish hornbills, numerous kingfishers and birds of prey. The Kanha valley is not a volcanic crater, though the enclosing hills are a consequence of geologically ancient volcanic activity. The horseshoe-shaped Kanha valley. which accounts for nearly a third and the oldest part of the Kanha National Park. The history about Amarkantak reveals that during the Chendi dynasty hold the region was followed by the kalchuris in the 10th century. The region in the earlier days was believed to be known as the ayodhya, as mentioned in our vedas, puranas that there was a ashram for the saints of kapil muni and rishi markand. Amarkantak receives large number of tourists throughout the year. Being a pilgrimage destination, majority of them are Hindu devotees. Apart from being a pilgrimage destination, it is also a popular hill station. So for those who are interested in hill station pilgrim then it is the best option in Central India. 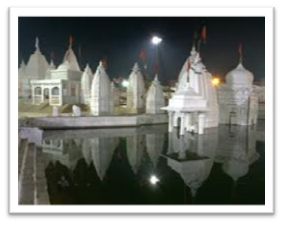 Being origin of Holy Narmada River, devotees takes this place with great devotion and respect. While visiting Amarkantak we can see various temples, Kapildhara, Temple of Kalchuri era & Narmada Kund from where river Narmada originates and number of Ashrams. Hindu saints see this place with great respect and visits for meditation and feel the holiness of atmosphere. 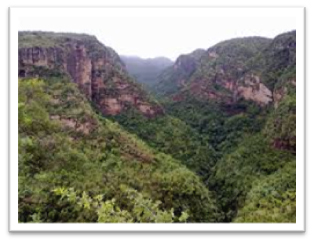 Pachmarhi has been harmonized the status of Queen Satpura hill range. Heart capturing waterfalls, scenic sites, large mountain range and lush green hillocks stretch over 60 sq. km in dramatic natural splendor. It is the most visited hill station of India. Pachmarhi was discovered by officer of the British reign, Captain James Forsyth in the year 1862. He got so much attracted towards the beauty of Nature in its purest form that he constructed the Lodge here. He wrote the book ï¿½The High Lands of Central Indiaï¿½ in which he has described the beauty of Pachmarhi and its myriad expression. Pachmarhi is highly indebted to Captain Forsyth for revealing this wonderland to the rest of the world and is all around development. Main Attractions of Pachmarhi are Apsara Vihar, Bee Fall, Chauragarh, Dhoopgarh, Handi Kho, Duchess Fall, Irene Pool, Jatasankar, Lanjee Giri, Pandava Caves, Priyadarshini Point, Rajat Prapat, Sunder Kund (Saunder's Pool), Tridhara (Picadilly Circus). The Khajuraho group of monuments has been listed as a UNESCO World Heritage Site, and is considered to be one of the "seven wonders" of India. The city was the cultural capital of Chandela Rajputs, a Hindu dynasty that ruled this part of India from the 10th to the 12th centuries. Political capital of Chandelas was Kalinjar. The Khajuraho temples were built over a span of 200 years, from 950 to 1150. The whole area was enclosed by a wall with eight gates, each flanked by two golden palm trees. There were originally over 80 Hindu temples, of which only 25 now stand in a reasonable state of preservation, scattered over an area of about 8 square miles (21 kmï¿½). Today, the temples serve as fine examples of Indian architectural styles that have gained popularity due to their explicit depiction of the traditional way of sexual life during medieval times. Locals living in the Khajuraho village always knew about and kept up the temples as best as they could. They were pointed out to an English man in late 19th century and the jungles had taken a toll on all of the monuments. dhuandhar also known as Smoke cascade, the picturesque dhuandhar Falls is located at Bhedaghat 30 km away from Jabalpur. ï¿½Dhuanï¿½ means smoke. The mist created by water falling on hard rock creates visuals of smoke emanating from the river bed. Hence it is called dhuandhar or Smoke Cascade. The white water pummels down to form a gorge known as the Marble Rocks. Just 98 ft high, it is still a popular destination edged by evergreen trees and shrubs. The sight of Narmada River falling down from a great height is a sight to behold. The smoke cascade formed by the water sprays, works as a treat for the eyes. dhuandhar falls is actually located on the Narmada river, one of the five holy rivers of India. It is believed that a dip in the holy river can wash away oneï¿½s sins. One can take a dip in the cool water along the banks upstream, Marble Rocks, located just around a km away from the waterfalls is worth seeing. If one is out for some adventure, crossing the river using the ropeway could prove exhilarating. Day 1. Arrival at Satna Railway Station from Kolkata, Transfer to Khajuraho, Check in at Hotel, Night Stay. Day 2. Eastern, Western and Southern Group of Temples visit at Khajuraho, Transfer to Bandhavgarh, Check in at GTV Resort (or Similar), Night Stay. Day 3. 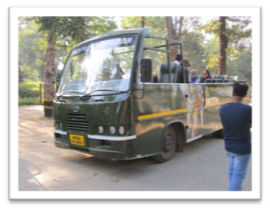 Jungle Jeep Safari Bandhavgarh and Mukundpur White Tiger Safari, Night Stay at GTV Resort Bandhavgarh. Day 4. Transfer to Amarkantak from Bandhavgarh, Check in at Hotel, Night Stay. Day 5. All Sightseeing of Amarkantak, Transfer to Kanha from Amarkantak, Check in at Resort, Night Stay at Kanha National Park. Day 6. Morning Jungle Jeep Safari Kanha National Park, Transfer to Jabalpur from Kanha National Park, Check in at Hotel, Night Stay at Jabalpur. Day 7. dhuandhar, Bhedaghat, Marble Rocks and 64 Yogini Temple Visit at Jabalpur, Transfer to Pipariya by Non AC Class Train from Jabalpur, Transfer to Pachmarhi from Pipariya by Road, Check in at Hotel, Night Stay at Pachmarhi. Day 8. Whole Day Pachmarhi Sightseeing, Night Stay at Hotel at Pachmarhi. Day 9. Check Out from Hotel at Pachmarhi and Transfer to Pipariya Railway Station. 1 White Tiger Safari, 1 Jungle Jeep Safari at Bandhavgarh and 1 Jungle Jeep Safari at Kanha is included (Share Basis) In Package, Including Guide, Driver, Gypsy and Permit. 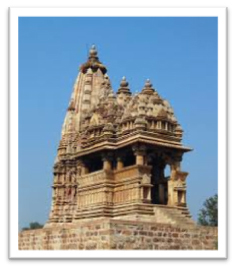 Eastern, Western and Southern Group of Temples Visit at Khajuraho is Included in Package. Amarkantak Sightseeing is Included in Package. 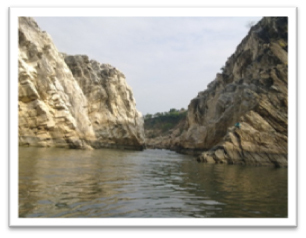 dhuandhar, Marble Rocks, Bhedaghat and 64 Yogini Temple Visit at Jabalpur is Included in Package. 1 Whole Day Sightseeing of Pachmarhi is Included in Package. All Transfer by Non AC Vehicle is Included in Package. Jabalpur to Pipariya by Non AC Class Train fare is Included in Package. Driver's Expenses, Toll Tax, Barrier Charge and Parking is Included in Package. Mineral Water, Cold Drinks or any Type of Drinks. Train Ticket from Kolkata to Satna and Pipariya to Kolkata. Rs. 10,599.00 Per Child (4 to 10 Years). Cancellation Policy: 50% Refund of Total Package Cost if Cancelled Before 45 Days of Arrival. Partial Cancellation is not permitted. Registration Fees - Rs. 1,000.00 Per Person (100% Adjustable in Package Booking). 50% of Package cost is required immediately at the time of Booking Confirmation. Remaining 50% before 15 Days of Arrival. Taxes and Service Charges should be paid at Bandhavgarh at the time of Check in at Resort. Package is available Subject to availability. All Subjects to REWA (M.P.) Jurisdiction. Note: Sorry to Travel Agents, No Travel Agent - Commission is Available in this Package. Please add your profit in package cost. Father's/Husband's Names of the Guests. Please ensure and certify that there is no Foreigner Tourist in your Group. Luxury Hotel in Bandhavgarh National Park.